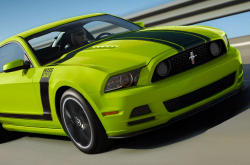 The Ford Mustang is one of the most celebrated, most popular muscle cars of all time. With roots going back several generations, the Mustang has developed a thick portfolio over the years. Ford Mustang buyers in Dallas and the surrounding cities have the opportunity to choose from several different model types this year, including a coupe, convertible, GT, Boss 302 and RTR. Each caters to a specific type of driver, from those that simply want a sporty roadster to those looking for a little track fame on the weekends. The V6 coupe and convertible offer a respectable amount of power at relatively low cost, while the GT, Boss 302 and RTR are true pavement burners that come equipped with high-horsepower engines, specially tuned suspensions, different braking systems and more. So the question inevitably becomes, "What Mustang is right for me?" Will it be an affordable base model or a high-end performer? With a little research, Ford Mustang shoppers in the Dallas area can selectively narrow down all of their different choices and arrive at a model and trim level that fits their needs. Continue reading the Ford Mustang review below to learn about each model's specs, engines, features and more. Compare the 2013 Ford Mustang side-by-side with vehicles like the 2013 Hyundai Genesis, Dodge Challenger, Chevrolet Camaro and the Nissan 370Z, and you'll see that the Mustang transcends the competition in several areas. Look through our Quick List below to find out why! Unlike independent auto centers, our Grapevine car repair facility offers accredited OEM parts, amazing Ford trained technicians and a 12-month long warranty for all jobs. We're also conveniently rooted near several recognized close by cities. Fords in Grapevine can take a whipping, so turn to the auto repair wizards in Grapevine - Grapevine Ford. We handle a wide array of jobs with without breaking a sweat, including Ford windshield wiper replacement, brake pad replacement and, of course, labor intensive tasks like transmission repair - and this is just a fraction of what we can handle. Grapevine Ford's got your back for all Ford Mustang maintenances in Grapevine, including incomplex factory recommended services. Check out our service specials by clicking on the link below. The only thing between you and some serious speed is just a few mouse clicks. The exciting Ford Mustang is one of America's seminal muscle cars, and the 2013 models carry one this exceptional pony car's legacy. So what'll it be? A V6, a GT, a Boss 302 or an RTR? A 2013 Ford Mustang from Grapevine Ford is waiting for you right now; don't hesitate to contact us or stop by for a test drive. You'll be surprised at how truly thrilling and fun-to-drive this sporty coupe or convertible can be. And just imagine the looks on your neighbors' faces when you drive one down your street! For more information on the 2013 Mustang, contact Grapevine Ford or look through our inventory online. Feel free to ask about pricing, add-ons, specs and more, and don't hesitate to set up a test drive. Low-rate financing is available to those who qualify, and we're more than happy to work with folks whose credit is less than perfect. This is your chance to get a piece of automotive history visit Grapevine Ford today! Search for your 2013 Mustang today!